Dean Magraw: guitar, Chris Bates: bass, Jay Epstein: drums. Jazz trio playing innovative sounds with strong emphasis on creative interactivity for the 21st Century off the launching pad of neo-bop Trane/Hendrix furnace. 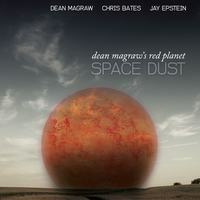 Master guitarist Dean Magraw presents his trio, Red Planet, in a stunning new CD, ‘Space Dust’, featuring original compositions and others that the band has been playing live since 2003. Space Dust exemplifies the magical direction that these three experienced jazz musicians have continually created. The last two selections of the disc were recorded live at the Artists’ Quarter in St. Paul. In other projects, Dean & Jay also play together in the trio, Impulso, with saxophonist Brandon Wozniak. Chris & Jay team up as the rhythm section for Framework & Klezmerica. Often on the bandstands of area festivals and jazz clubs, Red Planet—led by guitarist Dean Magraw, with bassist Chris Bates & drummer Jay Epstein—is one of the AQ’s most popular acts. One of the area’s most innovative threesomes, Red Planet will record live at the Artists Quarter in St. Paul. Dean Magraw is in the habit of wowing audiences with his fleet fingered plucking and creative compositions. Said Steve Tibbetts, "It's guitar, but it's so liquid, lyrical and effortless that it's like listening to a dancer." Starting out on bugle, St. Paul native Magraw studied classical guitar at the University of Minnesota and Berklee College of Music in Boston. For many years, Magraw was half of a popular partnership with mandolin virtuoso Peter Ostroushko. Straddling jazz, folk and bluegrass, he has performed with and/or recorded with Ruth McKenzie, Claudia Schmidt and Greg Brown, among others; he has explored his Celtic heritage performing with Celtic accordionist John Williams. Magraw’s first solo recording, “Broken Silence, won the NAIRD 1994 Best Acoustic Instrumental Album of the Year. Expect great tunes infused with Magraw’s impish humor. Chris Bates grew up with jazz, son of trumpeter/bandleader Don Bates. He began bass lessons in 4th grade and progressed to jazz studies at the University of Wisconsin-Eau Claire before returning to the Twin Cities to study with Anthony Cox. A member of the Motion Poets, Chris Bates has focused more on composing (he was a 1999 McKnight Composer Fellow) and playing regularly with Atlantis Quartet, How Birds Work, and with Epstein & guitarist Chris Olson in Framework (http://www.cdbaby.com/cd/frameworkmusic). Drummer Jay Epstein is seen all over the Twin Cities, often in the company vocalists (Bruce Henry, Connie Evingson, Nancy Harms) and top instrumentalists (Tanner Taylor, Park Evans, Bryan Nichols). He has released two highly acclaimed recordings with pianist Bill Carrothers & bassist Anthony Cox: ‘Long Ago’: http://www.cdbaby.com/cd/jayepstein & ‘Easy Company’: http://www.cdbaby.com/cd/jebcac. He often tours Europe with Carrothers & occasionally Italian pianist Giacomo Aula. Get ready for blast-off, the countdown is underway. Red Planet has been cleared for launch from subterranean Artists’ Quarter, downtown St. Paul, and you can be part of the live recording session on Thursday, April 5th!